Though Microsoft has portrayed a hands-on report with a purported pre-release build of Office for iPad as "inaccurate," rumors continue to point toward an iPad-optimized version of Office being a reality. A "working prototype" of Office for iPad was detailed on Tuesday by Matt Hickey of The Daily, News Corp's iPad news publication. But Microsoft quickly dismissed the details as "based on inaccurate rumors and speculation." Following Microsoft's denial, Peter Ha, the news organization's editor of its Apps & Tech section, took to his official Twitter account to claim that an image that accompanied the story in The Daily showing a purported screenshot of Office for iPad was not fake. 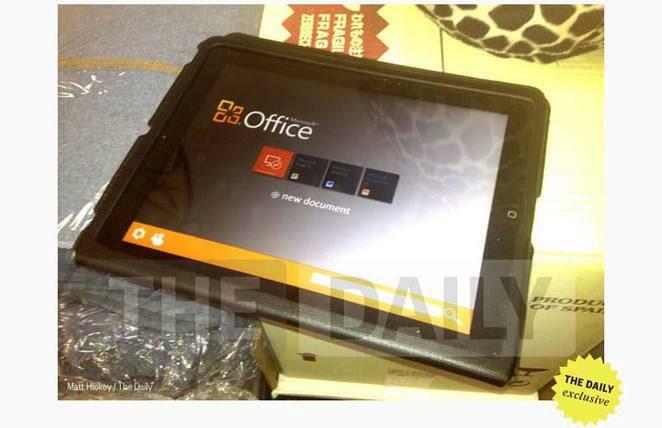 He also shared a picture of the supposed iOS icon for Microsoft's Office application. He also hinted at more details to come, stating that if Microsoft was unhappy with the original report detailing Office for iPad, "they likely won't be happy with our follow up." Later on Tuesday, he tweeted, "Today was fun. Let's do it again tomorrow!" Separately, Microsoft insider Mary-Jo Foley at ZDNet wrote a column stating that Microsoft's "denial" does not mean that the company is not building Office for the iPad. In fact, she said she expects that the Redmond, Wash., software company actually is working on a version of its productivity suite for Apple's touchscreen tablet. "So what about Microsoft's claims that The Daily's photos weren't of a real Microsoft product?" she wrote. "Remember: If something like the actual UI screen in a photo isn't yet final and subject to change in anyway, Microsoft execs technically can say this with a (semi) straight face)." For its part, Microsoft's Corporate Communications arm took to its official Twitter account to release its own statement: "Great respect for The Daily but regrettably someone is giving them bad info, and that'll be clear in the 'coming weeks.'" The "coming weeks" quote from Microsoft refers to the original story from author Matt Hickey, who indicated that Office for iPad could soon be submitted for approval to Apple's App Store and released, as he said, "in the coming weeks." Foley said such quick availability of the application strikes her as "potentially overly optimistic." Hickey's hands-on impressions with Office claimed that it will allow users to create and edit Word, Excel and PowerPoint photos locally and online, in an application that uses Microsoft's trademark Metro user interface.